NEWPORT BEACH – Gunk covered tires, cigarette butts and furniture are a few of the items volunteers with the Help Your Harbor Program have plucked from the waters of Newport Bay. Help Your Harbor, a volunteer-led program created by Billy Dutton, is making as big of a dent as possible in removing trash from local waterways. Dutton explained that the program was conceived from a discussion he had with Duffy Duffield after sharing what he learned from the two-week expedition down the Southern California coast on Riding Currents – a solar powered Duffy. “The takeaway for us was that for the most part, Southern California gets good marks for the conditions of its beaches, but most of the 12 harbors we visited were full of trash and there were some, but very limited efforts to address it,” he said. Dutton partnered with several local organizations including the Newport Irvine Rotary Club to take action and do something about the pollution in local waters. Newport was chosen as the pilot location and officially launched in February. On the first Saturday of each month, volunteers show up at the Balboa Bay Club where they deploy for a morning of cleanup. Volunteers head out on the Lower Bay in kayaks, stand up paddleboards and Duffy boats to various locations throughout the bay such as Basin Marina, Newport Island and the Rhine Channel. Those interested in cleaning up the Back Bay, depart from the Newport Aquatic Center on their own vessels or on kayaks provided by the center. Bill Zeller, a Newport Irvine Rotary Club member, noticed the large amount of trash polluting the bay while out kayaking. 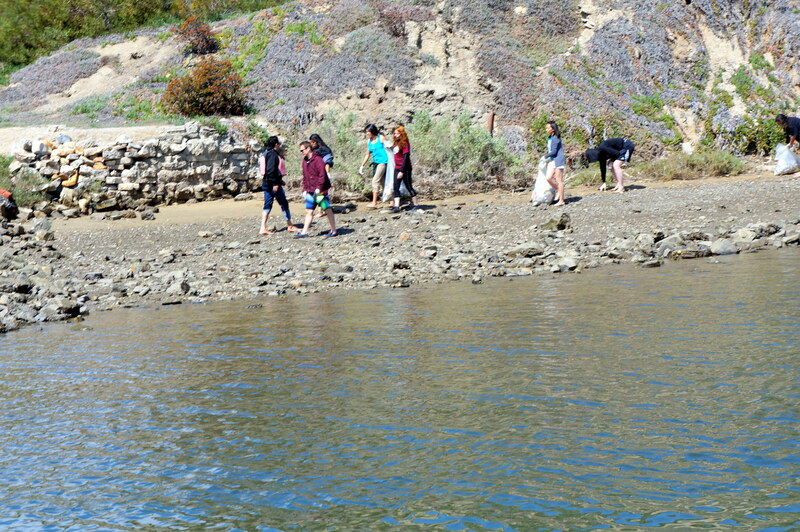 In February, the club joined forces with Dutton’s Help Your Harbor and began to clean up the bay. “There is all kinds of trash, particularly after a storm you get a lot of plastic, tennis balls, spray paint cans and large items such as furniture cushions; we even saw a couch floating in the Back Bay,” Zeller said. Four cleanups have been held, with the last one taking place on May 2. Close to 40 people volunteered at the cleanup, collecting more than 200 pounds of trash. A total of 600 pounds has been collected to date. Gathering the data on what is collected and how much is just as important as collecting the actual trash, Dutton explained. One of the goals of the program is to gather the data from cleanups and have that information made available to municipalities, institutions, policy makers and the public. The Help Your Harbor program is scheduled for 9 a.m. the first Saturday of every month. In Newport, meet at both the Balboa Bay Club and the Newport Aquatic Center. For more information visit, helpyourharbor.org.